Large Wild Bird (Parrot Mix) is specifically designed to provide a nutritional and healthy blend of seeds for medium to large sized Australian parrots, including Cockatoos, Galahs and King Parrots. A balanced combination of premium seeds, this popular blend contains Wheat, Oats, Red Sorghum, Corn, Grey Sunflower, Black Sunflower, Oats, Grey Stripe Sunflower, Dun Peas, White French Millet and/or Safflower. Small Wild Bird (Small Parrot) is a blend of premium seeds designed specifically to provide a nutritional and healthy seed mix for small Australian parrots and budgerigars. Canary Mix or Breeders Mix is designed to provide a nutritional and healthy blend of premium bird seeds perfect for feeding canaries and other small birds. Mid Parrot or Cockatiel Mix is a blend of premium seeds designed specifically to provide a nutritional and healthy seed mix for small to medium sized Australian birds including Cockatiels, Rosellas and other parrots. 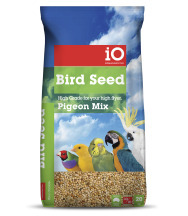 Pigeon Mix is a blend of premium seeds designed specifically to provide a nutritional and healthy seed mix for Pigeons Doves and other medium sized birds. Pigeon Mix is a combination of Wheat, Peas, Sorghum, Corn, Hulled Oats & Millet. Grey Stripe Sunflower Seed is lower in fat & oil than black sunflower, grey sunflower is a more healthy option for feeding both wild and caged birds. Poultry Grain Mix is made from a high quality of mixed grains that will keep any chook happy. is a delicious and nutritious mix that will be sure to keep your chooks happy. Made by Australia’s leading manufacturer exclusively for you. High grade for your high flyer.